OUR FIRST CONTRACT About Jackson Lewis P.C. The administration of Barnard College has retained the law firm of Jackson Lewis P.C. to represent it at the bargaining table. 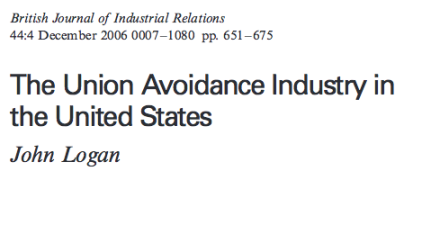 Given Jackson Lewis’s self-professed specialization in “union avoidance” and the information below, we are troubled by the administration’s decision to take such a confrontational, unproductive, and reactionary approach towards bargaining with its faculty, an approach which contravenes the ethos of a small feminist liberal arts college. Regardless, we remain resolved to fight for those changes in our working conditions that will enhance Barnard’s reputation as an institution committed to teaching and learning. 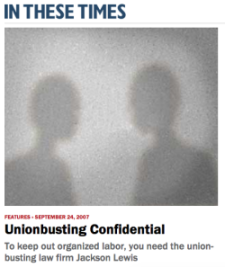 “Jackson Lewis is a key player in the union avoidance industry,” said Fred Feinstein, former general counsel at the NLRB. 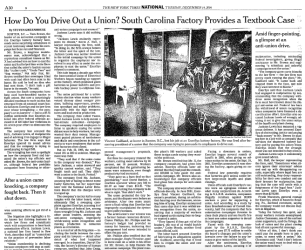 “This kind of aggressive anti-union campaign is not unusual.” […] EnerSys sued Jackson Lewis, accusing it of malpractice, including misleading federal investigators, giving illegal assistance to Mr. Brown and engineering “a relentless and unlawful campaign to oust the union.” […] EnerSys said that Jackson Lewis had engaged in malpractice by recommending that the company withdraw union recognition when the firm must have known about the illegal anti-union aid. Federal law bars the withdrawal of union recognition when companies have financed a decertification effort. EnerSys also accused Jackson Lewis of wrongly advising it not to give the union notice of the layoffs and plant closing.